Question: What is the most depressing day of the week? This is quite a nice little piece of gen ig research: not only could it trick the panel, but it tricked the people actually taking part in the study. I think that's a good one egg - at any rate I'd have followed the Gen Ig on that one. Me too. Have we any idea why people are so damned cheerful on Tuesdays? Answer: You just think that you hate Mondays, you actually hate Wednesdays more. Yes, I like this. Are you using it? The trouble with What is your least favourite day of the week? as a way of phrasing the question is that it doesn't necessarily elicit the klaxon-worthy 'Monday', which as this is a Gen Ig slot is maybe what we hope they would say? I can imagine a wide variety of answers, none of which would necessarily be Monday, although all of them might be funny. It's not in our script at the moment Flash - if you want it then it's all yours. I agree with Jenny. I think the original question is better. The research shows up a couple of other interesting points. The article says the results are a good example of "memory bias." Since we're expecting Monday's to be depressing, we tend to remember particularly bad experiences that happened on a Monday, while forgetting the good times. Likewise, as we're expecting Fridays and Saturdays to be a riot of fun, we tend to remember good experiences that happen on those days and forget all the bad things. Thus, our choice of memories reinforces what we already believed, even if it has no basis in reality. This is the same kind of behaviour that gives rise to superstitions. People remember bad things that occurred when they, say, broke a mirror, and forget about all the times they broke a mirror and nothing bad happened, or all the times they didn't break a mirror and something bad happened. Selective memory suddenly convinces someone that breaking a mirror is "bad luck." 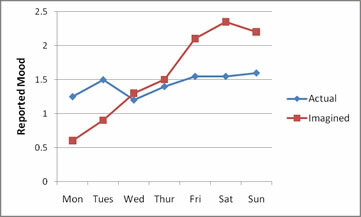 Another interesting point is that the mood ratings show very little difference throughout the week. The researchers have, unfortunately, not put error bars on their points but I would imagine that it's entirely possible that the average mood actually doesn't change at all, and any differences are merely statistical fluctuation.